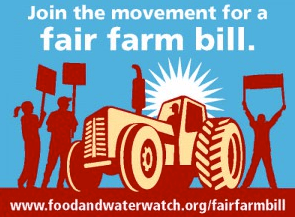 When Jane Wiedenbeck, Grand Rapids field organizer for Food and Water Watch, contacted me about putting next week’s kickoff meeting for the Fair Farm Bill Campaign on the Eat Local, West Michigan! calendar, I knew I had to know more. Farm policy is near and dear to my heart as I watched my Dad “fight the man” as a potato and onion farmer when I was growing up. “The goal of this campaign is to help fix our broken food system and make it so national food legislation supports fair markets in which small farms can compete, and sustainable and healthy food for consumers,” said Wiedenbeck. “One of the major concerns with the American food system is that year after year, large corporate farms are pushing out small and mid-sized family farms. Independent family farms are driven out out by national agricultural policies that favor huge corporations, while the small farms that are the backbone of American agriculture (and of Michigan’s economy) are disappearing. “To help stop this, here in Grand Rapids, we are working on a local campaign to ensure that some fair farm legislation, the Fair Farm Rules (GIPSA rules) are funded in the Senate. These rules would help to support small and mid-sized farmers who raise cattle, hogs, and chickens by making it easier for them to compete against larger factory farms. They will be coming up for a funding vote in the Senate this fall. Our goal is to urge Senator Debbie Stabenow to support the funding of these rules. As of yet, Senator Stabenow has not come out either way on the issue. She is the chair of the Senate Committee on Agriculture, Nutrition, and Forestry, and thus she has the power to stand up for small farm owners and local, sustainable food by supporting these rules. We are building a grassroots campaign to ensure this happens, so that we can work towards a more fair food system that supports small, local agriculture and sustainable food. Friends, I know that politics and bills are usually confusing and not so interesting. (For a Cliff’s notes version of the issues, download the Fair Farm Bill Factsheet). However, if you read my opinion piece at The Rapidian yesterday, you know that we HAVE to do something about hunger and food security here in the U.S.–beyond handouts.